How to add the /tmp folder to Favorites on the Sidebar of Finder? Can someone let me know if it is possible to add /tmp to Favorites on the Sidebar in Finder? If yes can someone provide me the steps? Press shiftcommandG to bring up Go to the folder:, then type in /private and press enter. Drag the tmp folder to Favorites in the Sidebar. The first method places the folder at the bottom of the existing Favorites, whereas the second method allows one to drag it where one wants. It also can be dragged after the fact to change its position in the Favorites. Both methods have been tested by me to work in OS X Mountain Lion, OS X El Capitan, macOS High Sierra and I see no immediate reason one or the other will not work in other versions of OS X/macOS that actually support this action. Then drag that folder to your Favorites in your sidebar. 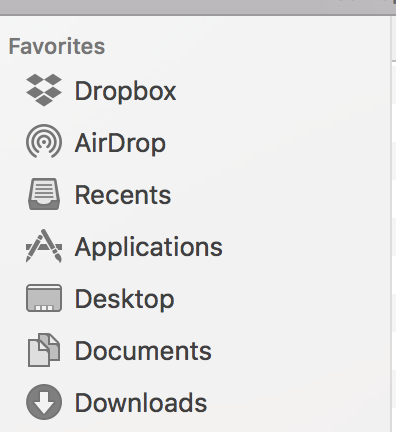 How can I remove a folder that no longer exists from my Finder sidebar in Lion? How do I add more categories to Mac OS X Finder's sidebar? How do I remove Keybase from my Finder Favorites?